This book has some similarities to The Tomorrow Mirror in that it takes an ordinary object, in this case a phone, and imbues it with special powers. It’s also aimed at teens and has a moral lesson to it. As Others See Us has a girl as the main character, while The Tomorrow Mirror has a teenage boy, but I don’t think it’s too girlie a book, although it deals with the issue of popularity which might be something girls think about in a different way from boys. The idea came in bed in Germany where I was tutoring and where I spent a lot of time with nothing to do other than think or write. By that time, I’d finished writing The Tomorrow Mirror and my mind was wandering. It came from the envy I have always had for people that can sing. Unlike Gemma, I don’t have any aspirations for fame but, on the other hand, if I could sing, you’d never shut me up just out of the sheer pleasure of being able to make beautiful sounds. So the question in my mind was imagine you could be given the gift of being able to sing, but not just a so-so voice, the special ones like Whitney Houston, Elvis, Barry White, Aloe Blacc, Susan Boyle, Tom Jones and my new favourite, George Ezra. But you have the choice of either only you being able to enjoy this incredible voice while everyone else just hears you as you are, or, everyone else can hear it and be transported by it, except you. I think I’d go for the former but then again, part of the joy of singing must be sharing it. Tricky. This is the fascinating thing about writing for me. How a What if…? scenario can lead to a whole story. And where was that story before you thought of it? Soon after Gemma gets a new phone, strange things start happening. Despite not studying, she’s suddenly getting top marks in every subject. Her tennis skills improve dramatically, attracting the attention of the best-looking boy in the school. And everyone wants to be her friend. But how has this happened? And is this new Gemma the real Gemma? Despite only just having come on sale, the book was actually officially published in 2014 so copies have just reached Japan in time for the nominations for the Extensive Reading Award (which I won last year). I’ll find out at IATEFL what it’s up against, assuming it’s selected, but, seeing as so few publishers seem to be putting readers out nowadays, I suppose I’ve a good chance! So, if you happen to end up with a copy*, there are general ideas for using Graded Readers in class here. **Note I did not report it to CUP since a) I figured it was not a real download but would lead to a virus and that is its own form of justice b) I think fighting that sort of thing is a waste of my time as it is unwinnable c) I was on my phone at the time and couldn’t be bothered to copy the link, find out who to email, paste it, write the email etc. d) I never saw it on subsequent searches. I am sure CUP would have acted had a)-d) not applied. Sounds like a great title, Nicola. Looking forward to getting it for our library! 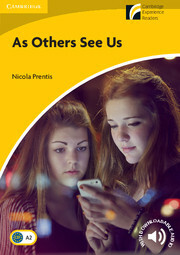 This entry was posted on January 15, 2015 by Nicola in Graded Readers, Writing and tagged As Others See Us, book release, CUP, EFL, ELT, ELT materials writing, ESL, teen graded readers.